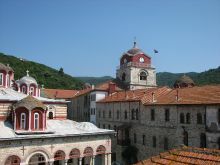 The Monastery Esfigmenou celebrates the Ascension Day. Regarding its name, the predominant view is that its owner was a monk who had a rope too tightly bound around his waist. The Monastery is located on the north east coast near the Monastery of Hilandariou. 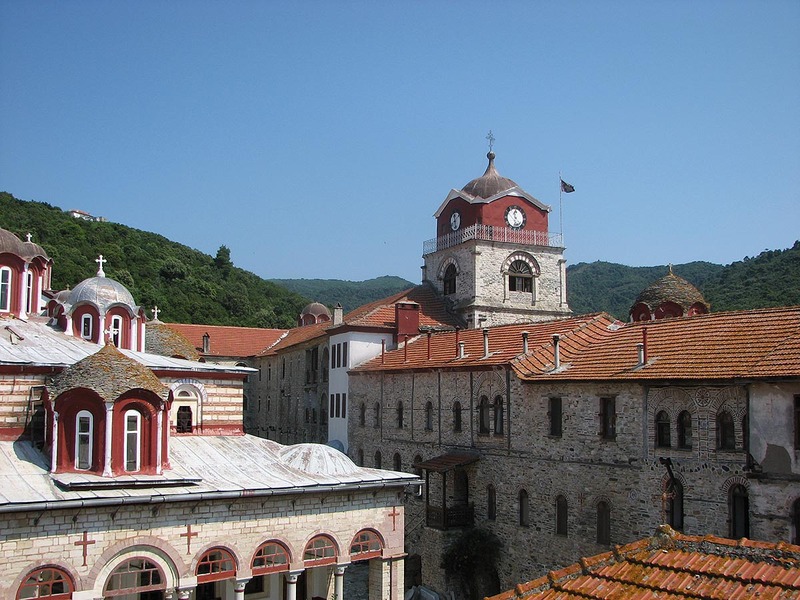 One version sets the establishment of the monastery around the 5th century with owner the sister of Emperor Theodosios, Pulcheria. As an indication for this version are the few ruins in a 10 minute distance from the Monastery. 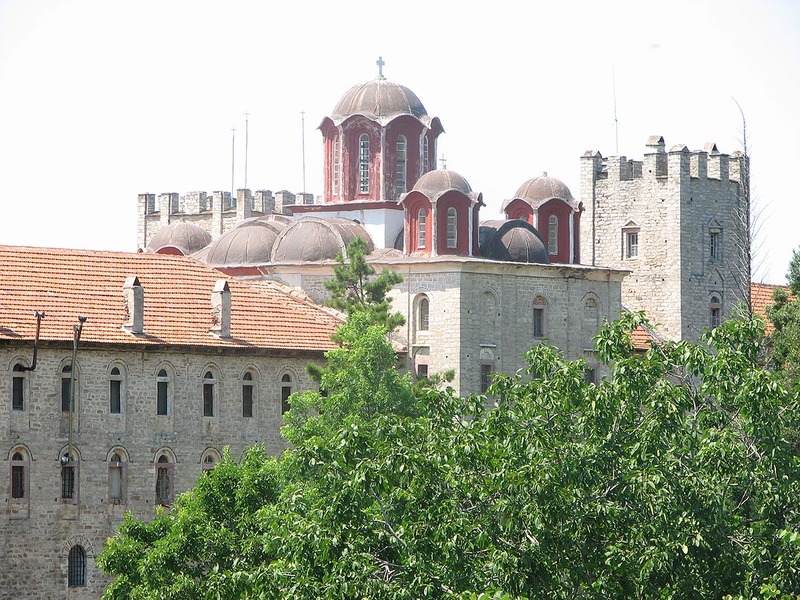 The monastery Esfigmenou is not mentioned in the first Document of 971/972, therefore it did not yet exist. 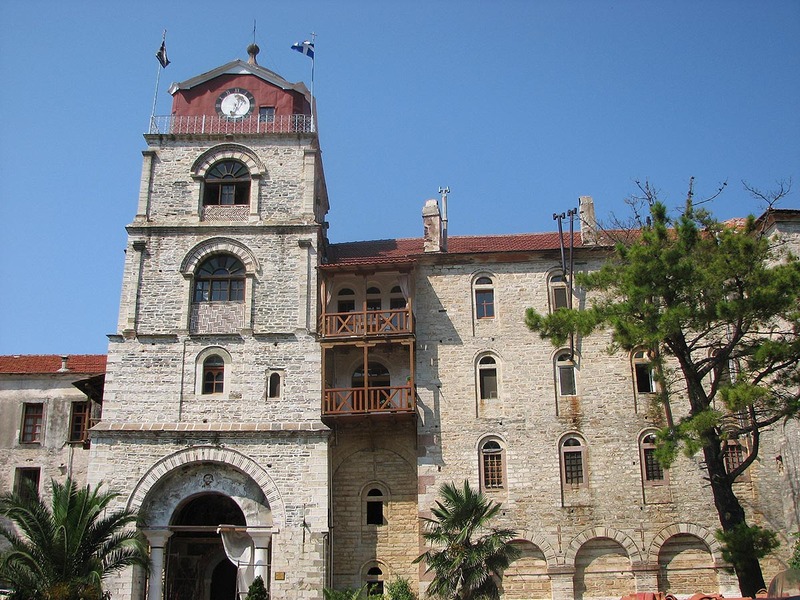 But it is mentioned in an official document of 1030 and in the second Document of Athos signed by 29 abbots and sealed by Emperor Constantine Monomachos in 1045. 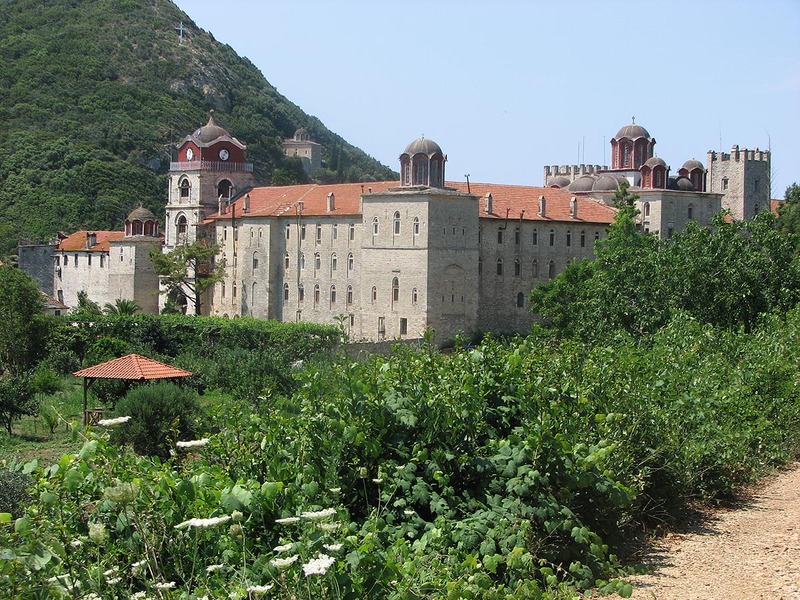 This Document places Esfigmenou in the 5th position in hierarchy of the monasteries in Mount Athos while today it is in the 18th position. In the third Document of 1394 it holds the 9th position between 25 monasteries and it holds the same position until 1430 among 19 monasteries. 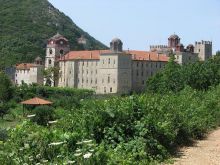 The fact that the monastery is exposed on the shores of the peninsula of Athos contributed to frequent invasions and attacks of Saracens, looting mercenaries and by Catalan troops. 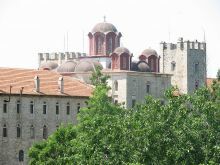 Until the Occupation of Constantinople the Monastery Esfigmenou had benefited from the financial support of Byzantine emperors and from sovereigns of Moldova and Wallachia. 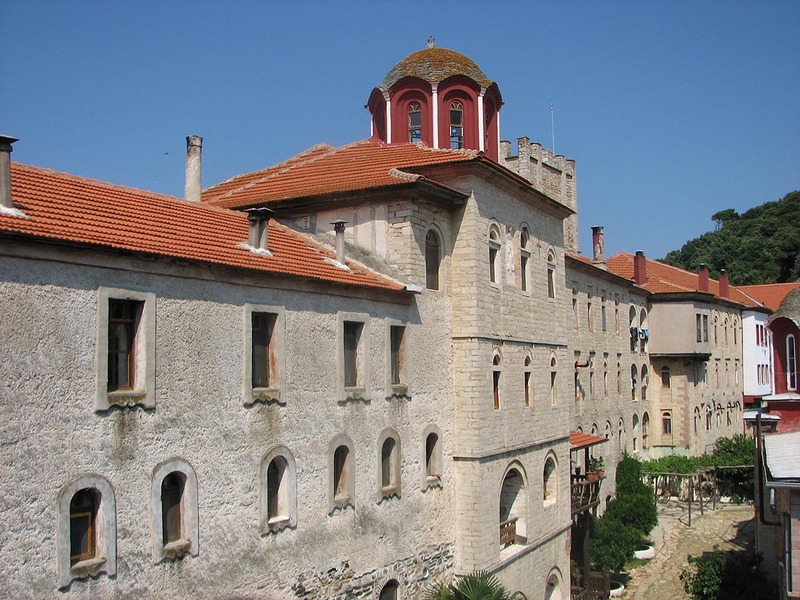 In the 14th century the monastery was destroyed by fire but thanks to the financial assistance of the Serbian King Stephanos IV and the abbot Georgios Vrankovich it managed to rebuild and to continue its extension until 1533. In 1797 the metropolitan Griogorios V with a patriarchical seal converted it into a commune and in the same way of life that follows until today. The Katholikon was built and painted in 1806-1810 and it was inaugurated in 1811 by Grigorios. 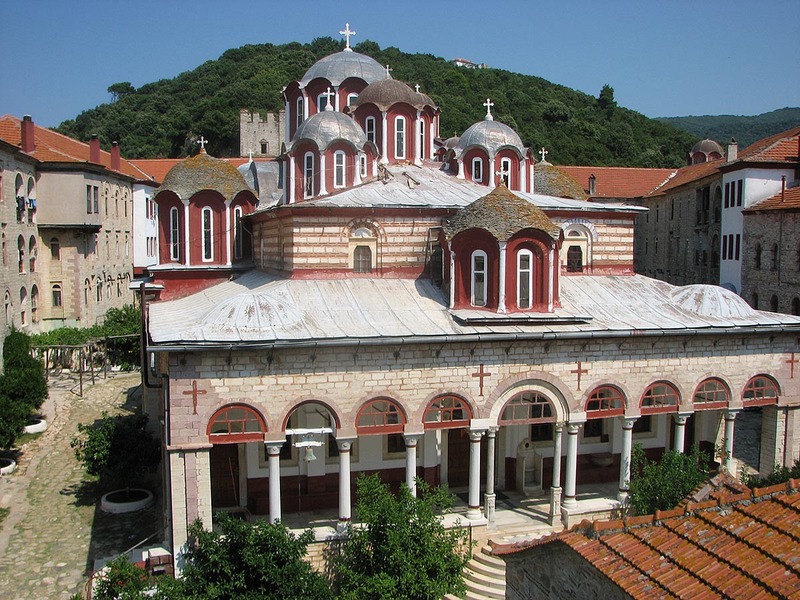 In 1817 the altar was painted by the painters Zaharias, Beniamin and Makarios while in 1841 the walls and the roof of the narthex were painted by the painters Gerasimos, Anthimos, Ioasaf and Nikiforos. 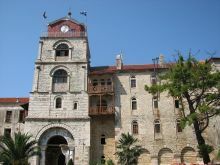 The Prothesis was renovated in 1810 and painted at the expense of the abbot Efthymios but the biggest part of the frescoes was destroyed by the fires of Turkish troops in 1821. 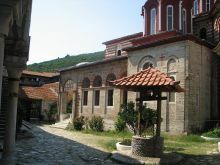 The Stoup was built in 1815 by the abbot Efthymios in place of the byzantine stoup. 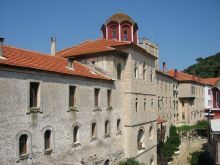 At the monastery there are 8 chapels, 5 of which are located outside the walls and particularly important is the small church dedicated to Antonios Petsersky. It also has 3 Seats and 2 Cells. In the library there are 372 manuscripts and about 2,000 old printed books. A large part of the library was destroyed by fires and raids. Among the 72 parchments there are some valuable works such as an illustrated book of months (minologio), the code no. 14. This code is one of the three volumes that each of them is associated with one third of the ecclesiastical year, which begins on the 1st of September. In the sacristy there are functional utensils, seals, documents and sacred relics. Also there is a piece of golden fabric, which once a year of the Ascension Day, is used as curtain in theGreat Gate of the Katholikon. The fabric is said that it comes from the scene of Napoleon and it is a gift of Grigorios V when he was ordained metropolitan. Another valuable work of art is the small mosaic picture of the 14th century of Christ in a silver frame with performances of Apostles and inserts of holy remains. 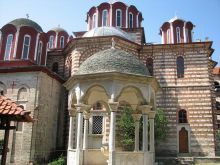 Guests should visit the Katholikon with the murals of Galatsanon painters (1811), at the sacristy part of the scene of Napoleon Bonaparte and at the historical library the rare illustrated manuscripts.